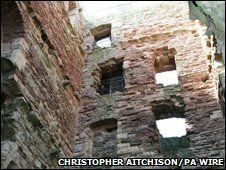 An eerie picture of a figure in period costume at the window of a Scottish castle has won a competition to find the world's most convincing "ghostly image". 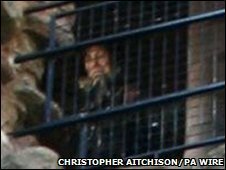 The picture, taken in May 2008, appears to show a man or woman wearing a ruff, looking through a barred window at Tantallon Castle in North Berwick, East Lothian. No mannequins are used at the castle, and there are no costumed guides. Three photographic experts have confirmed that the photograph was not manipulated. Christopher Aitchison, a visitor who took the photograph said: "I was not aware of anyone or anything being present in my picture, only noticing the anomaly when I got home. I did not notice any nice old ladies wearing ruffs walking around the stairs! "Some people have suggested it's just light reflecting on rocks, and one person suggested it may be King James V of Scotland." Psychologist Professor Richard Wiseman, who has made many studies of the supernatural, launched the investigation a month ago. He asked members of the public to submit ghostly images for experts to analyse. More than 250 pictures were received from all over the world, and there was then a public vote on which people thought were the most convincing photos. Professor Wiseman, himself a confirmed ghost sceptic said that the importance of faces to our lives means our brains are programmed to see them even where they don't exist: "I suppose it could be another visitor looking a bit strange. Perhaps someone will come forward." The study is part of the Edinburgh International Science Festival, and will be discussed at a one day public festival called "Hauntings" which will examine the evidence for the existence of ghosts. Co-organiser Dr Caroline Watt from Edinburgh University said: ""Even though we had the public submit their most mysterious photographs, the images we received don't provide compelling evidence for spirits. If ghosts are out there, it seems they are somewhat camera shy. "